If you've been reading here for a while, you know that we love a good theme outfit. So, when I saw this ant print skirt, I knew I needed to pair it with a red gingham shirt for the perfect picnic theme outfit. I know, not everyone feels the need to dress so specifically for a picnic, but just work with me on this one, okay? I also think an outfit like this would work perfectly in an Edward Scissorhands type setting. I mean, if all else fails, it also makes a cute Halloween costume, right? 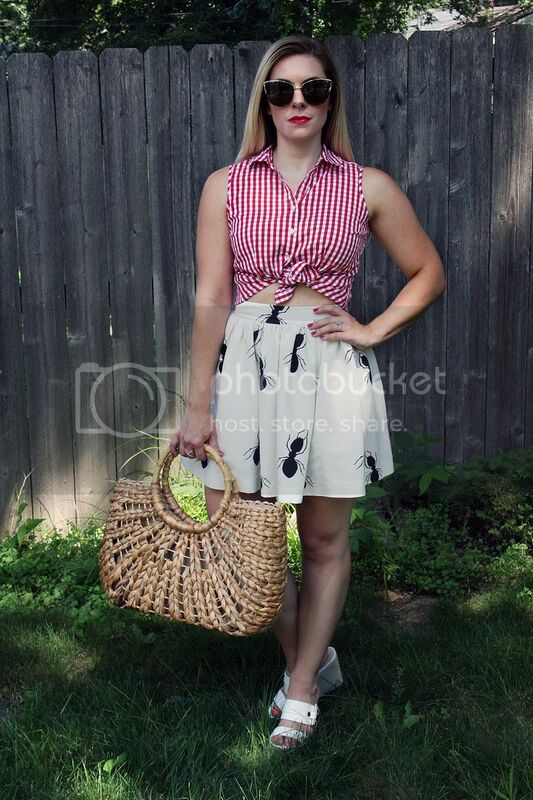 And no picnic theme outfit would be complete without a wicker basket. I kept my vibe 50's Stepford wife retro with a red lip and wedges as well. Care to join me for a picnic? Let's hope the only ants that crash the party are those on my skirt.